Lima beans also known as butter bean, sieva bean or Madagascar bean, is a legume grown for their flat, crescent-oval-shaped seeds or beans. There are two types of Lima beans, bush beans and pole beans. Bush Lima beans grow to about 2 feet (60 cm) tall and tend to have smaller seeds and bear fruit more quickly than pole Lima bean varieties. Pole Lima beans have large seeds and can grow 10-12 foot (approx, 3-3.7 meters)high. Lima beans have pale green pods that vary from 3-8 inches (7-20 cm) long depending upon variety. It is only the seeds that are eaten with Lima beans not the pods. While Lima and green beans are similar in many respects, when growing Lima beans there are some specific growing differences. The Lima bean is a frost tender annual and depending upon type and variety require 60-90 warm, frost-free days to reach harvest. Growing Lima beans in full sun is preferable but they will tolerate some shade. Sow Lima beans in the garden 3-4 weeks after the average date of the last frost in spring when the soil temperature has warmed to 65° or more and overall temperatures are consistently warm. Lima beans grow best when temperatures are between 70 and 80 F. They will not set pods in temperatures much above 80 F, or in cold wet weather. Hot, dry conditions during blossoming may cause many of the flowers to drop off without setting pods. Growing Lima beans have similar soil condition needs to green beans. They prefer loose, well-drained soil rich in organic matter, with a soil pH of 6.0 to 6.8. Prepare planting beds in advance by working in plenty of aged compost. Although many garden shops offer many bean varieties as seedling transplants it is not a recommended practice. All Bean varieties germinate quickly with generally good germination rates and beans do not like their roots being messed with making transplanting a very hit and miss deal that usually is not very successful. Bush beans; Sowing directions for bush bean varieties in general are; Sow seeds 1 inches (25 mm) deep, spaced 2-4 inches (5-10 cm)apart within the row. Rows should be spaced 2 feet (60 cm) apart. For continuous harvest through the growing season, sow succession crop of bush lima beans every two weeks. Trellising; Sow seed 1 foot (30 cm) from the trellising, space seeds 4-6 inches (10-15 cm) apart. Teepee poles; Push 3 or 4 poles into the well cultivated garden in the teepee configeration. Space teepees far enough apart that you can work around them, usually about 3 foot (approx 1 meter) between the outside of the teepee circle. Sow 3-4 seeds per pole. Bush bean varieties - Thin to 4-6 inches (10-15 cm). 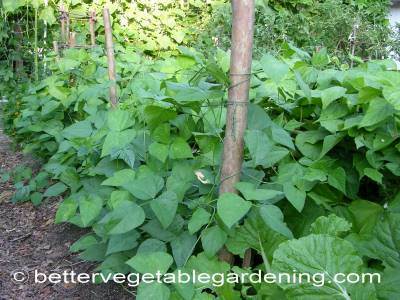 Pole bean varieties - Trellising - Thin to 6-8 inches (15-20 cm) apart. 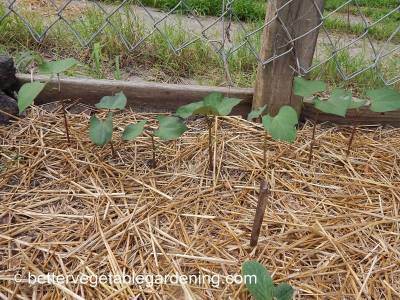 Pole bean varieties - Teepee poles - Thin to 2 strongest seedlings per pole. 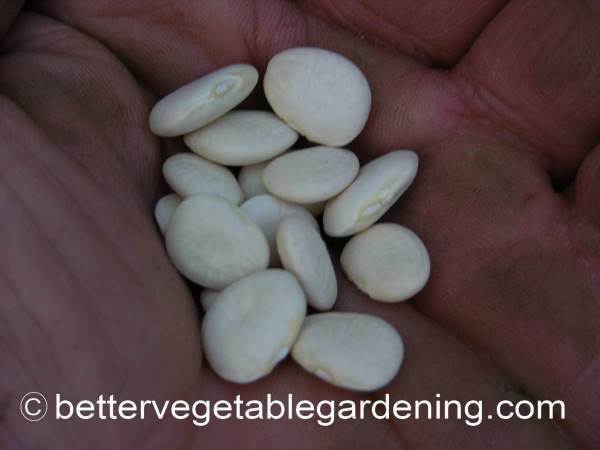 Lima beans like a well drained soil with consistent moisture content rather than infrequent heavy soaking. The most important time is during blossoming and pod development. Keep a good thick mulch on the bed at all times. Fertilizer requirements for growing Lima beans is similar to snap beans. For both bush and pole beans, 2-3 weeks before planting apply 2-3 quarts per 100 sq feet (2.2-3.3 liters per 9.3 square meters) of a good all-Purpose 5-5-5 Organic Fertilizer. The only difference between bush and pole bean fertilizing is due to the shorter growing period of bush beans compared to pole beans. Pole Lima beans - Side dress at the same rate as initial application. Side dress as the first flowers are setting and at 2-3 week intervals after that. 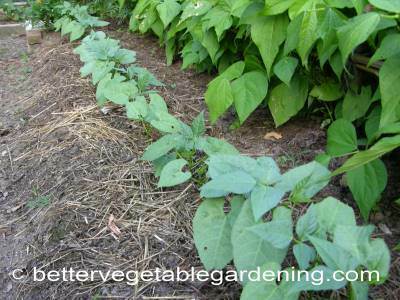 Bush beans don't normally require support but often a simple low support can help to keep growing beds tidier and make harvesting easier. 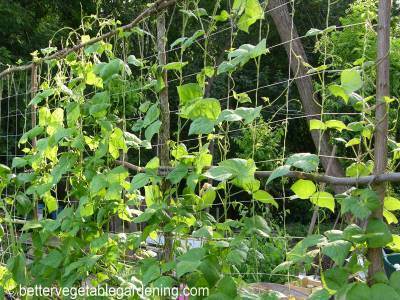 Trellising is a very popular choice of support for any pole bean variety. Teepee pole type support is good for pole Lima beans. Beans are susceptible to many soil-borne diseases; rotating beans so that they do not grow in the same location more than every three years will reduce soil-borne diseases. 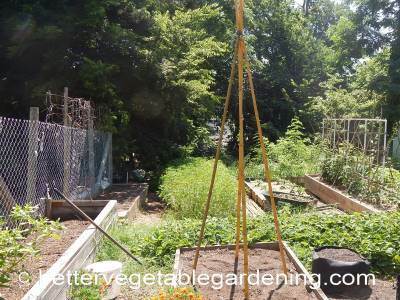 Rotate beans to plots where lettuce, squash, broccoli, Brussels sprouts, cabbage, cauliflower, or collards have grown in the past year or two. Aphids, bean leaf beetle, beet and potato leaf hopper, cabbage looper,corn ear worm, cucumber beetle, cutworm, European Corn Borers, Japanese Beetles, Mexican Bean Beetles, slugs, white fly, wireworm. Anthracnose, bacterial blight and wilt, bean and common mosaic, curly top, damping off, powdery mildew, rust, white mold. Bush Lima bean varieties are ready for harvest from 60-80 days from sowing. Pole bean varieties are ready for harvest in 85-90 days. Begin harvesting Lima beans when the pods are well-filled, firm, bright green and still tender. Pick regularly to keep plants flowering and producing new pods. Pods left too long will result in seeds that are tough. For short term, whole Lima beans can be stored at 32 F for 10-14 days. Longer term storage Lima beans can be; Frozen, canned or dried. Dried and shelled Lima beans can be stored in a cool, dry place for 10 to 12 months.